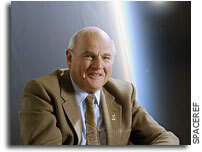 NASA Ames to Host Tribute to Nobel Prize Winner Baruch Blumberg\n\n\"Among the speakers scheduled at the tribute celebration are former NASA Administrator Daniel S. Goldin, Ames Research Center Director S. Pete Worden and members of the Blumberg family. Also featured will be a video tribute and presentations by the Mars Institute, the Challenger Center for Space Science Education, and NASA Ames. The tribute will be webcast at http://connect.arc.nasa.gov/blumberg\"\n\n Keith's note: I will be making a presentation on Tuesday on behalf of the Challenger Center for Space Science Education. This page contains a single entry by Keith Cowing published on June 20, 2011 8:25 PM. Cuts To NASA's Exobiology Program was the previous entry in this blog. Dordain on ISS Transportation: We Have no Transportation Policy is the next entry in this blog.